Presented here is a century-old collection of photographs and stories from Niagara Junction, part of the Lehigh Valley Railroad. 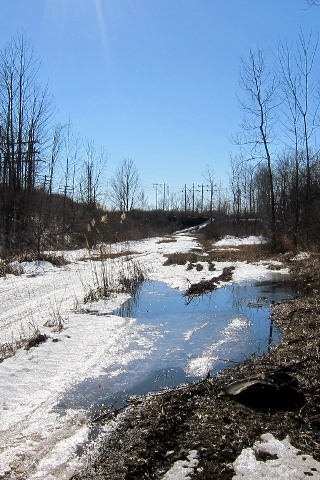 Niagara Junction is the point in Depew, New York where East-West main line traffic could go North on the Niagara Falls branch to Tonawanda Junction, and then onto New York Central tracks over the suspension bridge into Canada. Three photos below were scanned from pictures I took in the Fall of 1981. 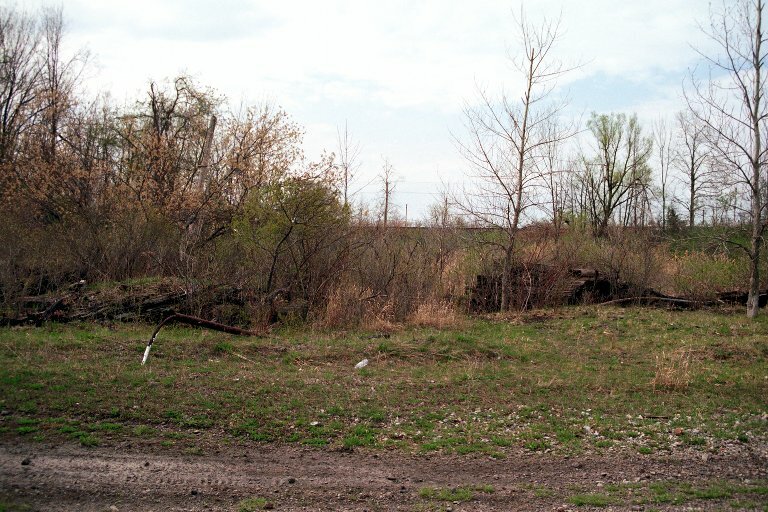 A second roll was taken in April, 2008 after a friend in a far-away country suggested I take pictures of something during a weekend trip to Buffalo; Niagara Junction was my favorite railroad haunt growing up, so the decision to revisit it was an easy one. On March 24, 2015, I returned with a digital camera to capture another round of images (though, in retrospect, I should have taken film). 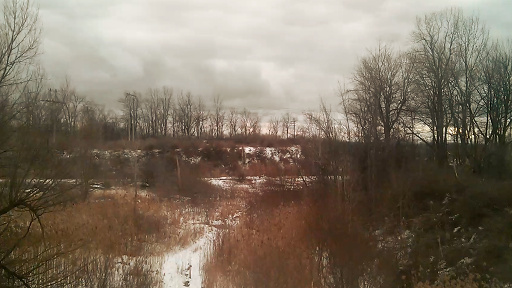 And then the following year, in February 2016, I recorded a short video through the window of an Amtrak passenger car as we passed by the junction. 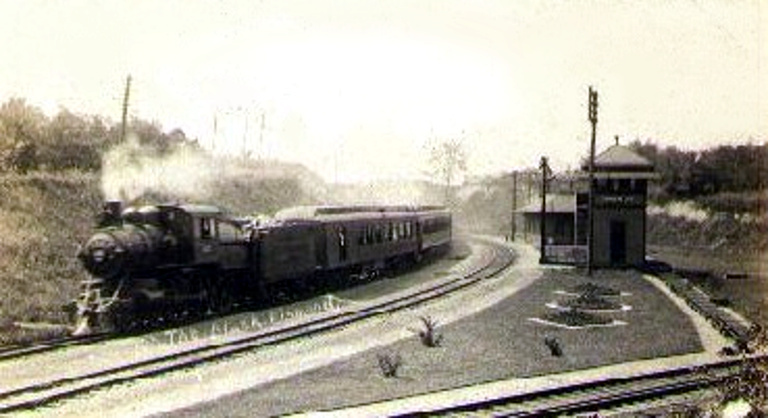 A photo of the Black Diamond Express passenger train from 1907. 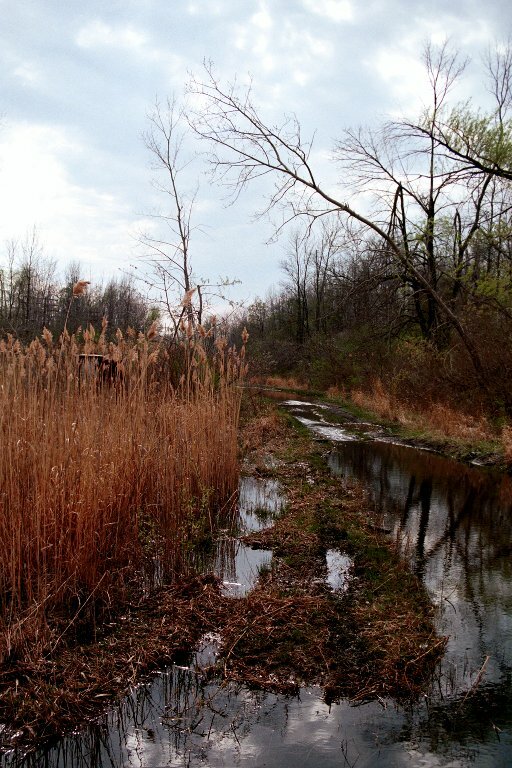 Doug Kroll contributes a couple wonderful photographs from the 1970s depicting Niagara Junction before it was abandoned. Paul J. Templeton provides shots of the interior and exterior of Niagara Jct. Tower and supplies a great deal of first-hand information regarding the operational aspects of Niagara Jct. 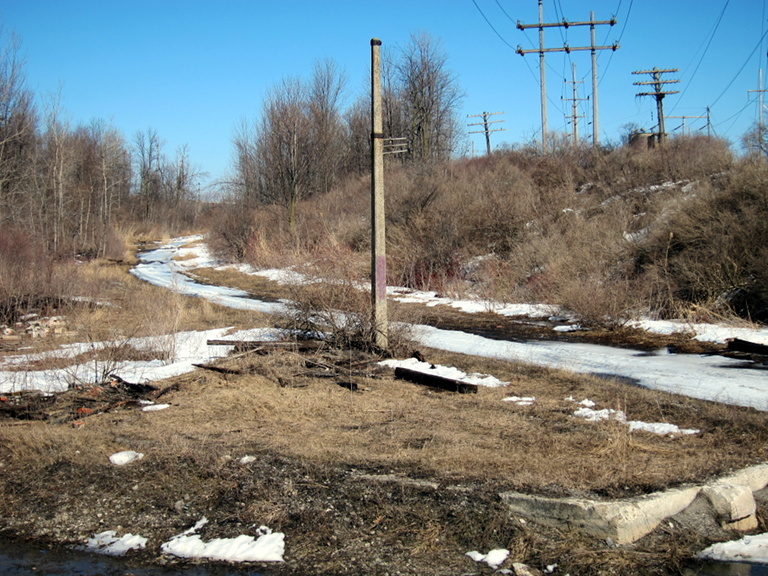 Richard Pearson supplies a picture of the East end of Niagara Jct, where we can see the remains of the Depew passenger station. 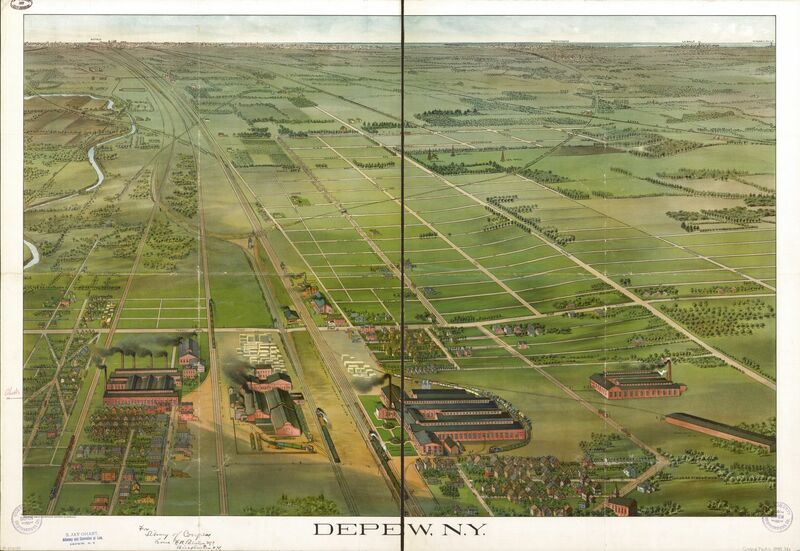 A bird's-eye-view of Depew (including the Niagara Junction) from the Library of Congress, drawn in 1898. 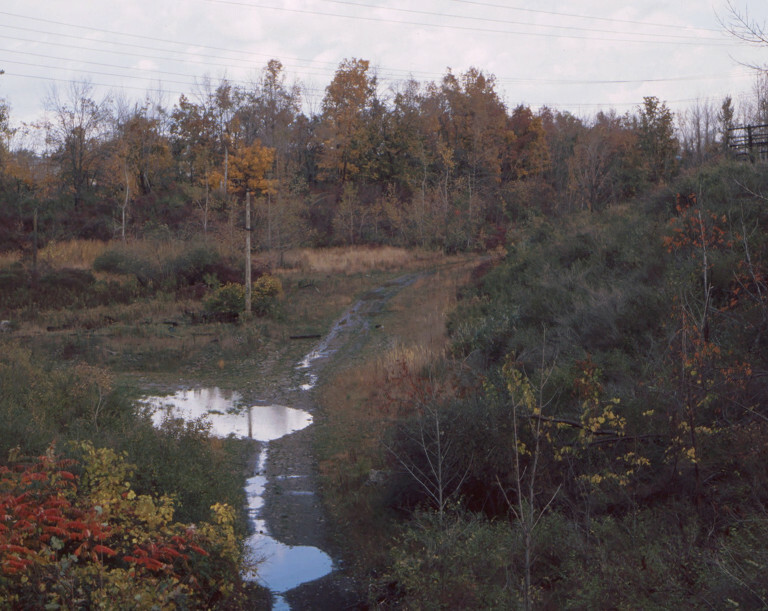 The three photographs at the top of this page were taken over a period of 65 years from about the same location, along the westbound entrance to Niagara Jct. The first picture comes to us via Paul Templeton and was taken from atop a signal mast that once stood here. With the signal mast long gone, the latter shots were taken at ground-level. 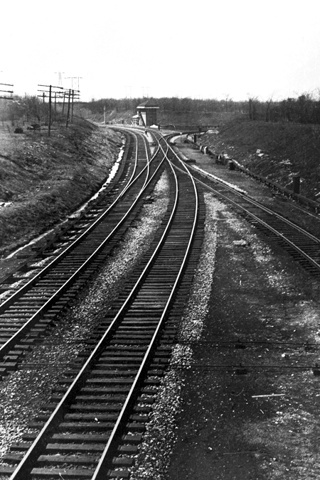 Additionally, in that first photograph, you can see the original Niagara Jct. tower and, behind it, construction of the smaller (red-brick) blockhouse that would soon replace it. Coming full circle, the last picture on this web page will show the same blockhouse, now in its final days. For the most part, photographs below are arranged in tabular format. Rows indicate pictures taken during the same year (earliest first) and columns represent pictures shot from approximately the same location. By looking down a column of photos, we can see how a particular scene has changed over the years. I also scanned in an assortment of "Lehigh Valley Railroad documents," many of which were collected here at Niagara Jct. And all of which, have since been donated to the Williamsville Depot preservation project. Here are a pair of aerial views of Niagara Junction and the surrounding area. The first is from 1923 and the second shows how it looks today. The second map is actually an interactive Google map, with selectable pinpoints to identify where each group of photographs were taken. 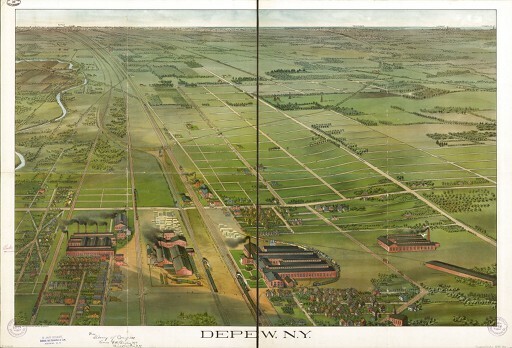 There are more excellent overhead pictures (including a 1904 USGS Quadrangle Map of Depew) over at Todd's Railfan Guide to Depew. Nathan Lewinski, another Niagara Junction aficionado, discovered the above 1898 Map of Depew on record at the Library of Congress (click on the map to view a larger image). The Niagara Junction, with its control tower standing tall, can be seen to the left of center. This map looks West, so the Lehigh Valley main line enters at the bottom of the page and heads up into Buffalo, while the Niagara Falls branch line runs off to the right toward Tonawanda (no airport yet! :-)). Starting from the lower left corner, the first cluster of red buildings (with smokestacks) is Gould Coupler (History of Gould Coupler) where my grandfather worked. To its right (and over the DL&W tracks) is the Union Car Company, which in 1898 received an order to build 1000 of its standard 60,000 pound capacity box cars for the Lehigh Valley railroad (American Engineer and Railroad Journal, V. 72, 1898). 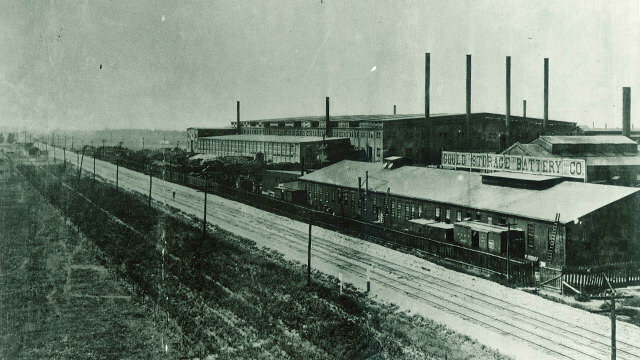 The following year, they would be folded into the American Car and Foundry Company and then closed down by 1902 as the New York Times reported that the DL&W was "negotiating for the abandoned plant of the Union Car Company at Depew." Further to the right (over the Lehigh Valley and New York Central tracks), that largest cluster of buildings is the New York Central Locomotive Works. The astute observer will also notice the Buffalo, Bellevue, & Lancaster Electric Railway as it snakes through Depew, down Terrace Blvd (where my Dad grew up) and over to Sanilac Street. According to Benedict Maryniak, in August of 1893, workmen for the BB&L started work on the underpass that took tracks on Sanilac beneath the Erie RR main line and down Sawyer Avenue into Lancaster. I always wondered why there was an underpass on Sanilac Street! 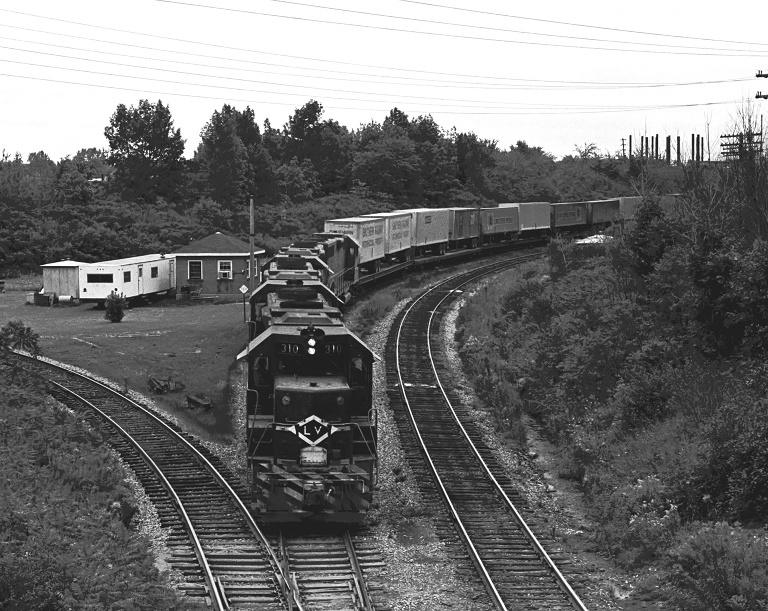 Four years later, the BB&L would become part of the International Railway Company. This is the eastbound home absolute signal that governed the western entrance to Niagara Junction. As I remember, back in 1981 these signals were no longer in operation and the glass lenses had been shattered. 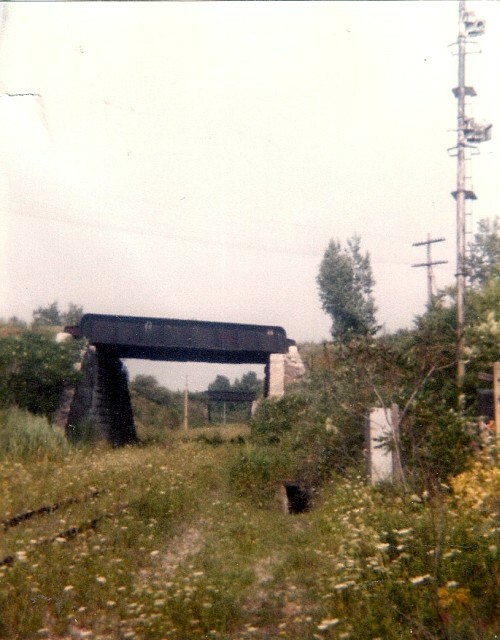 However, one of the tracks was still in use to handle local deliveries up along the Niagara Falls branch line. 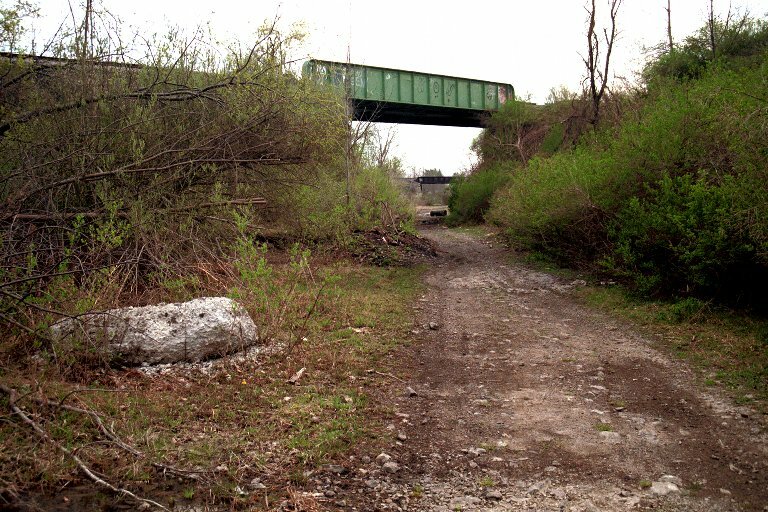 Paul Templeton reports that the 4.6 miles of track, from Niagara Jct. up to Williamsville, was finally abandoned by Conrail on July 22, 1982. This information coincides with last entry in the Amherst-Villa Road logbook, dated August 26, 1982. 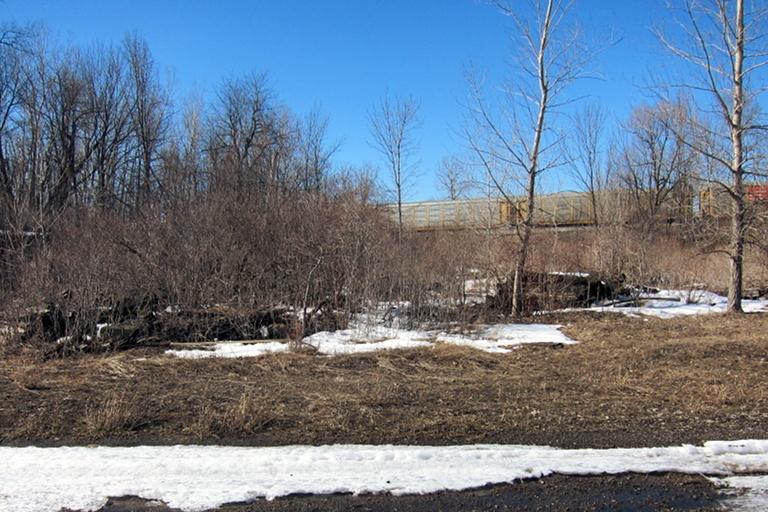 By April 2008, the tracks are long gone. 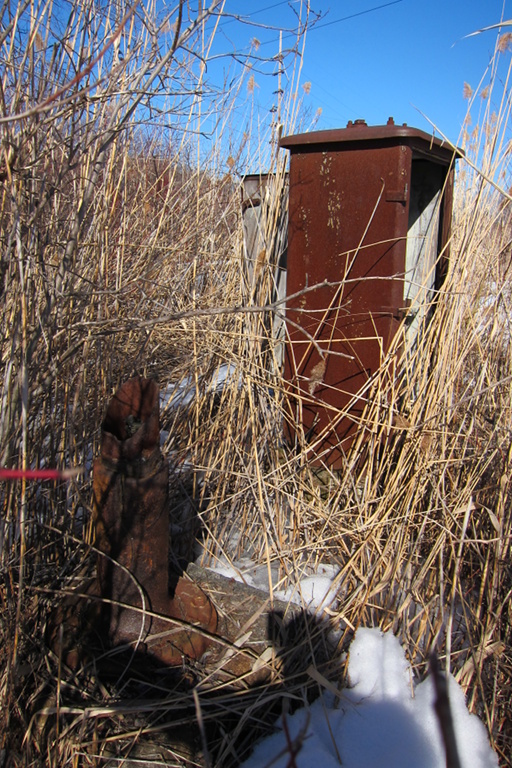 However, the control box remains in place with the signal pole lying on the ground behind it. Also, have a look at the water drainage ditch that is partially uncovered along the sides of these photos. They did a remarkable job building that as evidenced by the fact that water still runs through it today, with tadpoles and minnows swimming about in the Spring. In March 2015, very little has changed, though someone has apparently run off with the signal box door. And yes, that's Norfolk and Southern Engine 7589 leading an eastbound freight over the old Erie Railroad bridge. What a great way to start my day down at the junction! You can read more about these and other photographs in the Lehigh Valley section of Doug's photo album! This next collection of photographs are centered around the D. L. & W. bridge. The first column looks westbound toward Buffalo (leading away from Niagara Jct.) and the rest of the pictures show the way in. 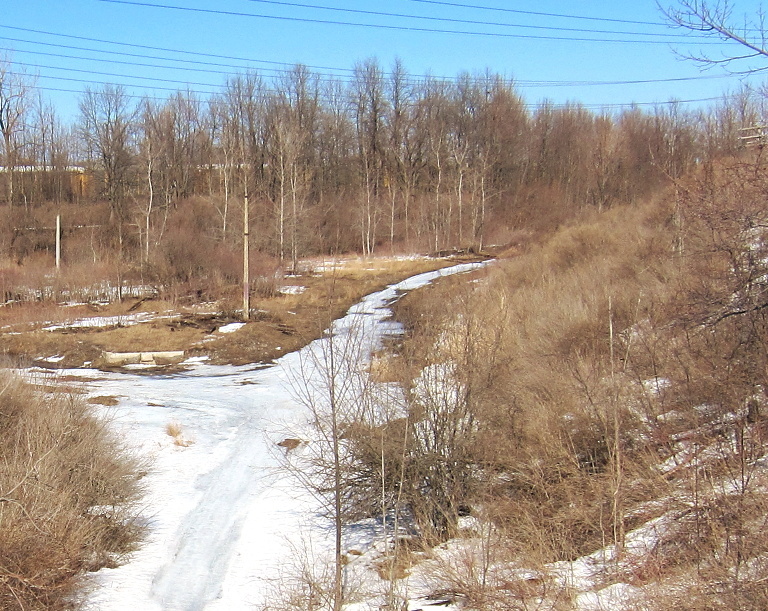 The picture in the middle was taken in 2008 from under the bridge, while the pictures in the last column were taken from above... looking eastbound, along the main line, with the Niagara Falls branch running off to the left. Now let's focus on that last column of photographs. Paul Templeton captured our first image on September 16, 1973 and it shows the westbound Apollo 1 passing through Niagara Junction. 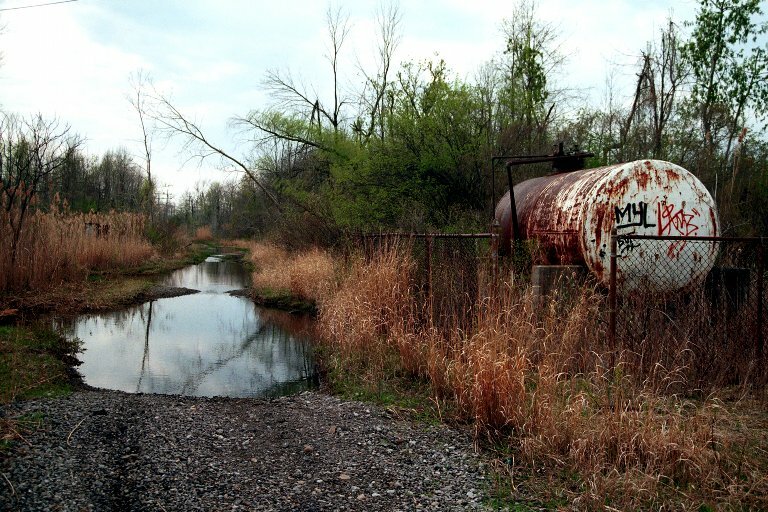 His second photograph from the Fall of 2006 depicts Niagara Junction in its abandonment. Then in March 2015, without knowing Paul had previously taken photographs here, I finally took my first picture from this bridge! Incidentally, you may have noticed that all of the photographs in that last column were aligned on the freestanding tell-tale concrete pole for the D. L. & W. bridge. Tell-tale poles hark back to the day when it was not against safety rules for workers to occupy the tops of cars in a train. Cords hung down from a cross arm mounted on the pole, and when these struck a person on top of a car, they knew that there was an overhead obstruction ahead that would not clear a person in an upright position. A close-up of this particular tell-tale pole can be seen here. Only once did I ever see a train come through here. I remember my brother and I were walking around the junction and heard a train coming from someplace. Surrounded by railroads, this was a frequent occurrence. However this one time, the rumbling sound was strangely muffled but growing louder. We couldn't figure out where it was coming from and it was becoming rather surreal because it kept growing louder. 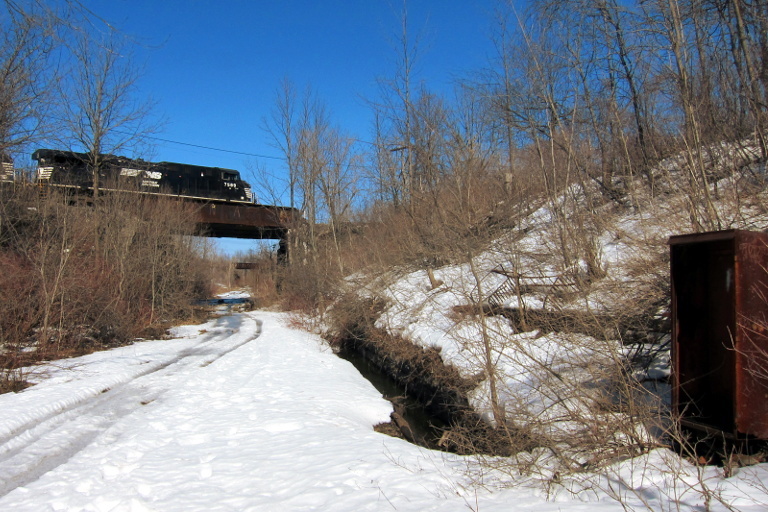 Then, entering the junction from the West came a Conrail-blue switcher at no more than 10 miles/hour followed by some of the most dilapidated rolling stock I had ever seen. 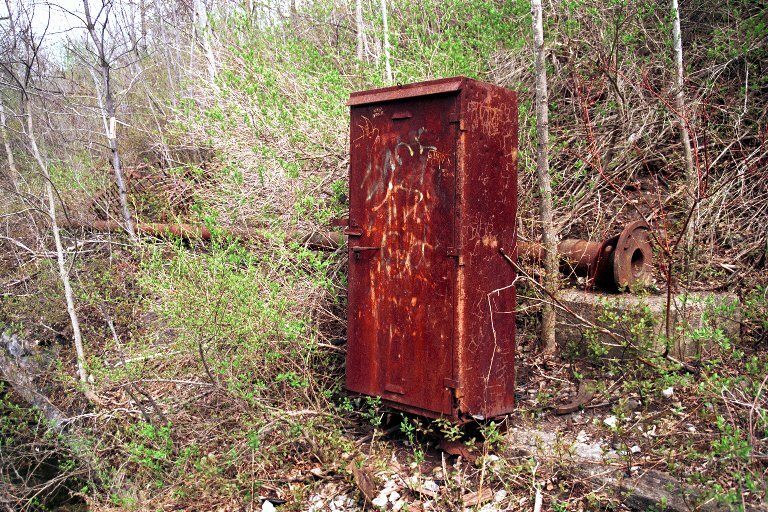 I seem to recall there was a Lehigh Valley caboose at the end of it, but I might be mixing up memories. My brother and I just stood there and watched as this rickety train poked along, rocking side-to-side around the curve and then North, up the Niagara Falls branch. Several years ago, I had to ask my brother to confirm this whole experience because it had an almost dreamlike quality in my mind (and I do have the occasional train dream, now and again :-)). When I asked him about it, he chimed right in with his recollection (whew!) and added one more thing: apparently, the engineer was shaking his finger at us as if to say we shouldn't be there! After reading this web page, my brother reminded me of another Niagara Junction story. Supposedly, there was a railroad inspector with the nickname Big Ernie who roamed the junction trying to maintain its once pristine look. According to a photographer we met there, you did not want to run into Big Ernie. Fortunately, we never did! The first photo above, dated 1907, shows the Black Diamond passenger train heading East on the main line through a very well-manicured Niagara Junction. 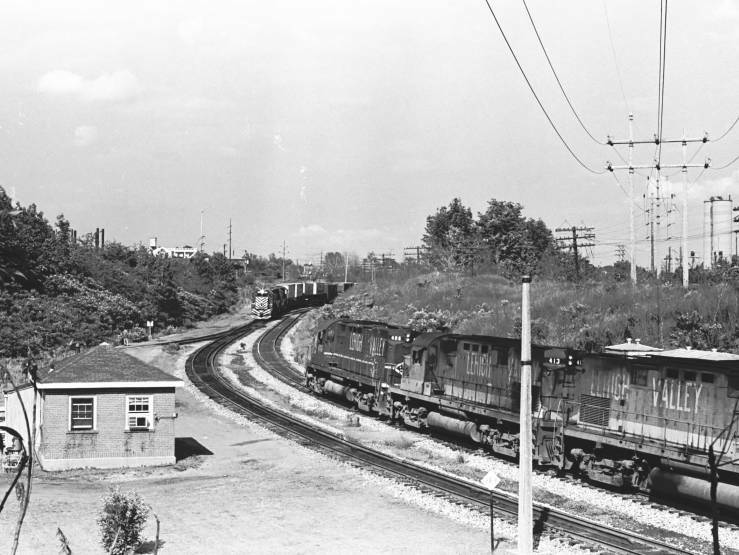 The high interlocking tower was replaced by a single story red-brick blockhouse circa 1950, which was affectionately known as the "Niagara Jct. Tower." Behind the tower was the original commuter station building. 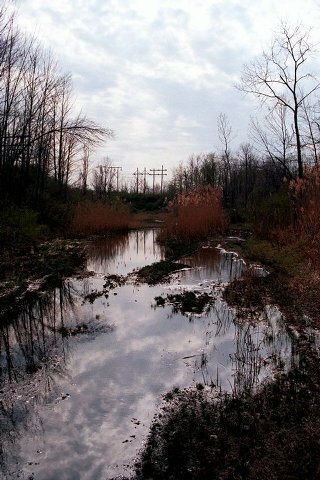 This photo shows the "Niagara Jct. 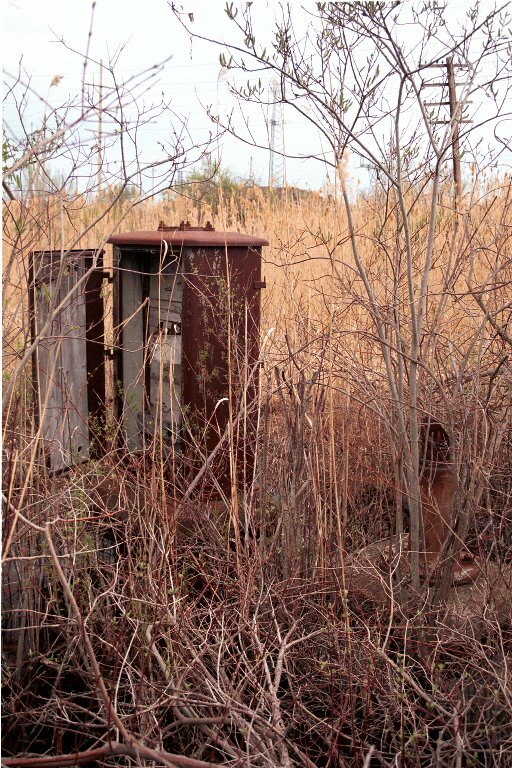 Tower" and the trailer that housed the Buffalo Division dispatcher after he moved from the Dingens Street Terminal when it was sold. Coming South off the Niagara Falls Branch is RS-3 #216 on the Tifft Yard to Niagara Falls and back local. 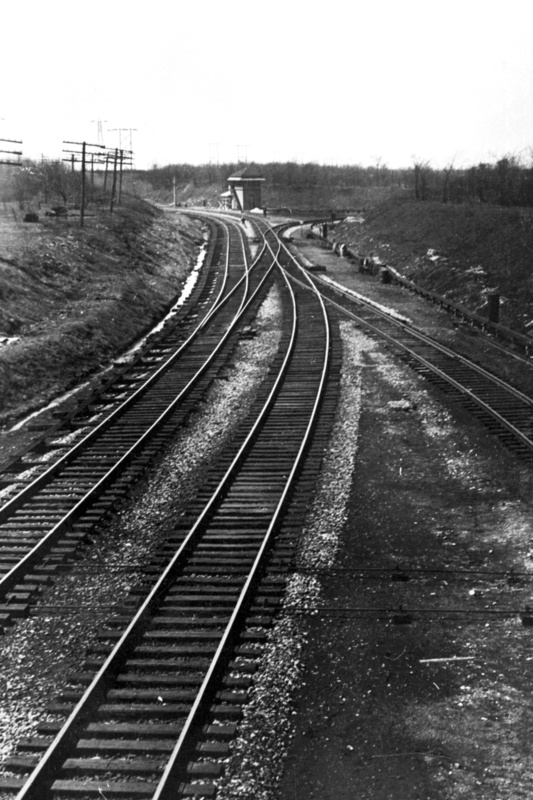 The date is March 23, 1976, just days before Conrail would silence these tracks and use the Penn Central (formerly New York Central) line in the background as their main route to NY/NJ. This is the Conrail Batavia local about to pick up some train orders at Niagara Jct. Tower on the very cold late afternoon of 21 December 1976. This job was very sporadic and operated until late June, 1978 when the Batavia-Niagara Jct. segment went out of service for all time. 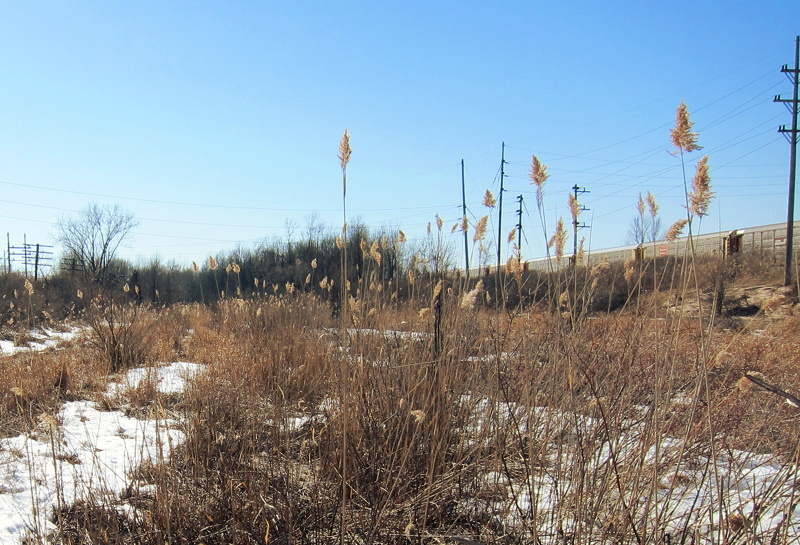 After Conrail, Niagara Jct. Tower remained open 24/7 until 03 January 1977, after which it was open 09:00-18:00 M-F. Later it went to "open on an as-needed basis", which was in effect in June, 1978. The tower was closed effective 05 August 1979. The tower originally controlled the Lehigh and Lake Erie Branch and the MT Tifft Jct.-Blacksmith Int. The dispatchers office in that trailer at Niagara Jct. 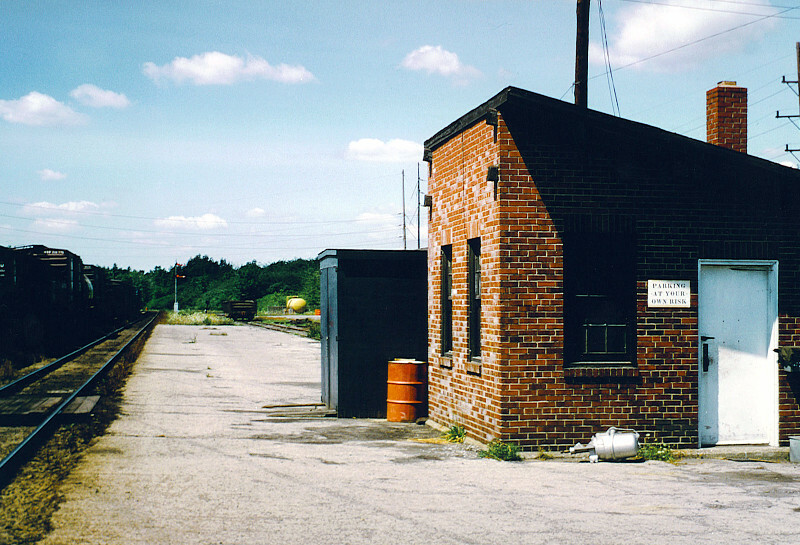 remained in use until 03 January 1977, after which the office was relocated to the Penn Central Buffalo Terminal. I visited Niagara Jct. many weekends 1973-1976 and got to know the tower relief operator, Ted Boris, plus the Buffalo Division Assistant Chief Dispatcher James Sorge. They were both great people. If I remember correctly, the regular day trick operator was Hank Sikora and the afternoon trick man was Vince Tabone. I never met the midnight operator as I was never around Niagara Jct. at those hours. The Tifft Terminal-Suspension Bridge local mentioned by Doug Kroll was TTN-1/NTT-2, and was also known by Lehigh Valley employees as the "Cross Town Pickup." Paul Templeton's second photograph was taken on September 16, 1973 and shows the interior of the red-bricked Tower. 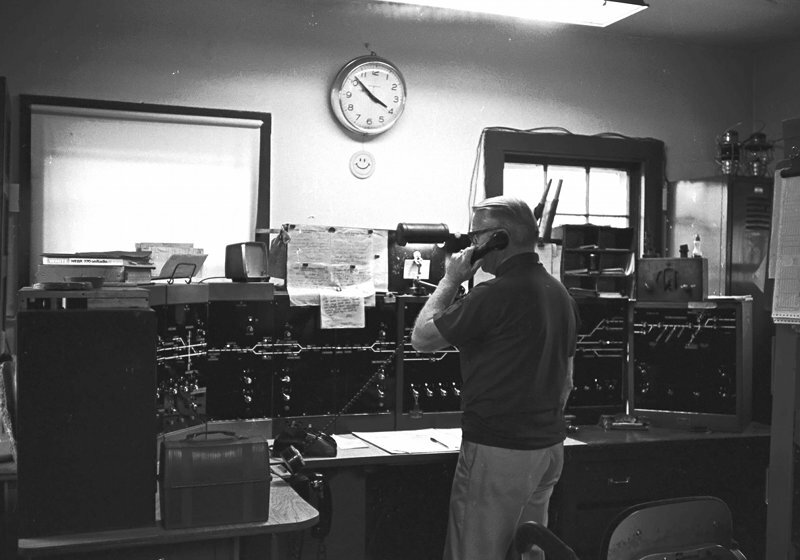 The man on the telephone was Ted Boris, "a relief operator and a true gentleman," who passed away a few months after the advent of Conrail. 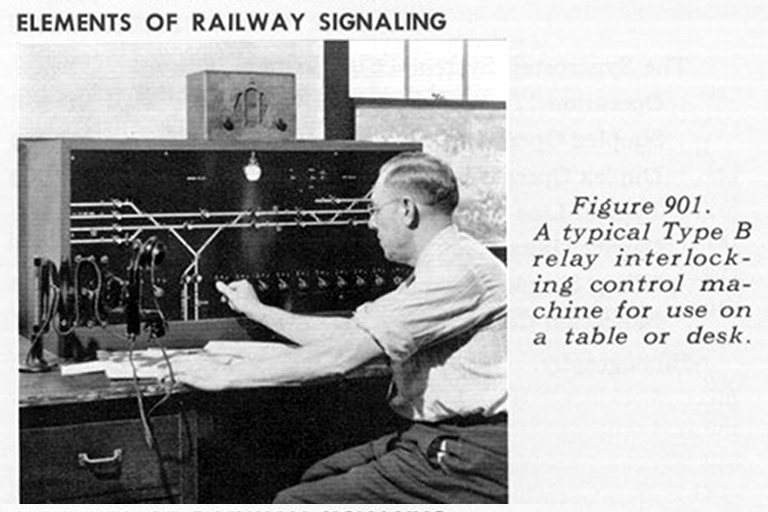 Above Paul's second photo is one from the June 1954 issue of the Elements of Railway Signaling. The new owner of this control panel included a close-up photograph where the words "Niagara Jct" are clearly visible, and the corresponding track layout matches our blueprint (see page 8). This earlier photograph (replete with classic scissor desk phone) was taken when only Niagara and Tifft Jct. were managed from this location. 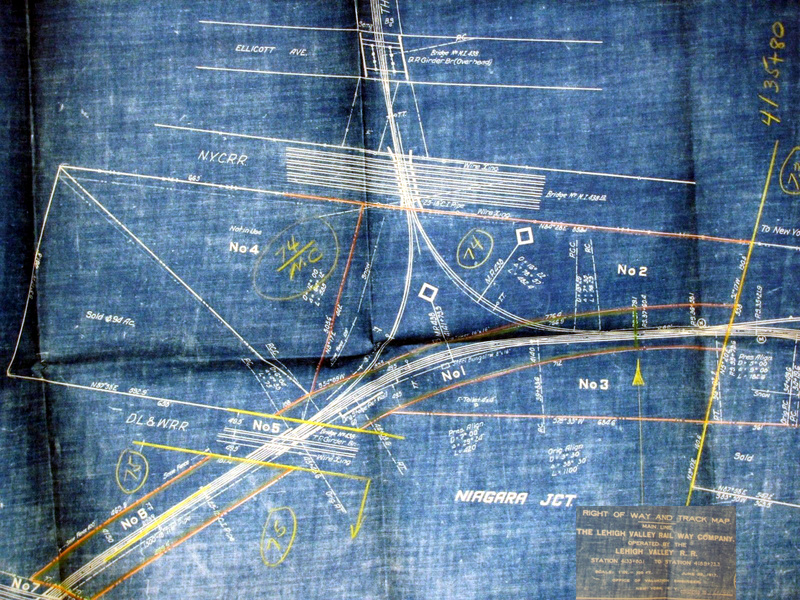 Compare this to the array of panels surrounding Ted Boris, where the rightmost one matches the layout for the Lehigh and Lake Erie Branch and Tifft Terminal (as evidenced by this blueprint), and panels to the left of Niagara Jct. controlled points East through Batavia. Moving to the last column of photographs, in the Fall of 1981, the cement footings of the red-bricked Niagara Jct. 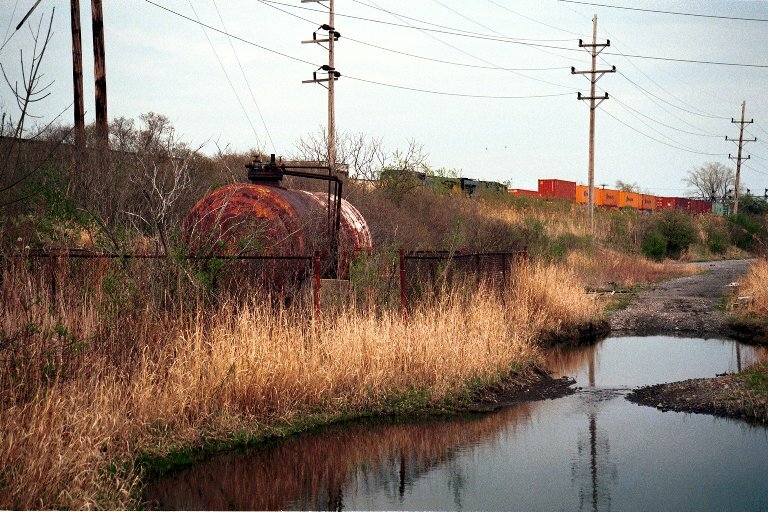 Tower are still visible directly behind the pair of (unused) main line tracks that run across the bottom of the first photo. Paul and I deduced that the tower was likely demolished during the Summer of 1980. 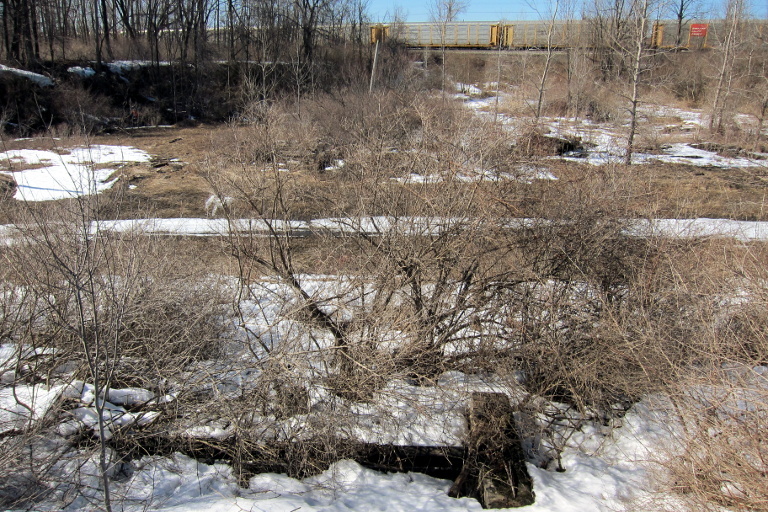 In the background is the start of the Niagara Falls branch line, which heads North under the New York Central railroad bridge and then under Walden Avenue. In the second photo, we're about half-way up the embankment and have come across a footing! 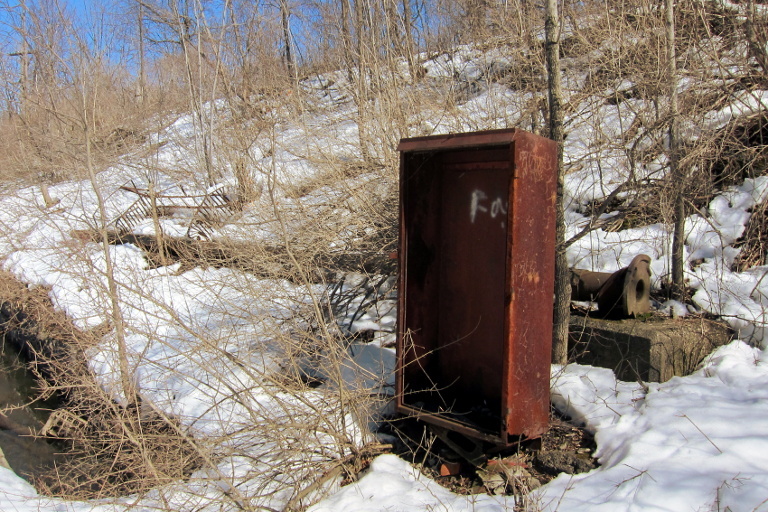 I don't know what stood here, but at 10 feet across, it was obviously built for something significant. 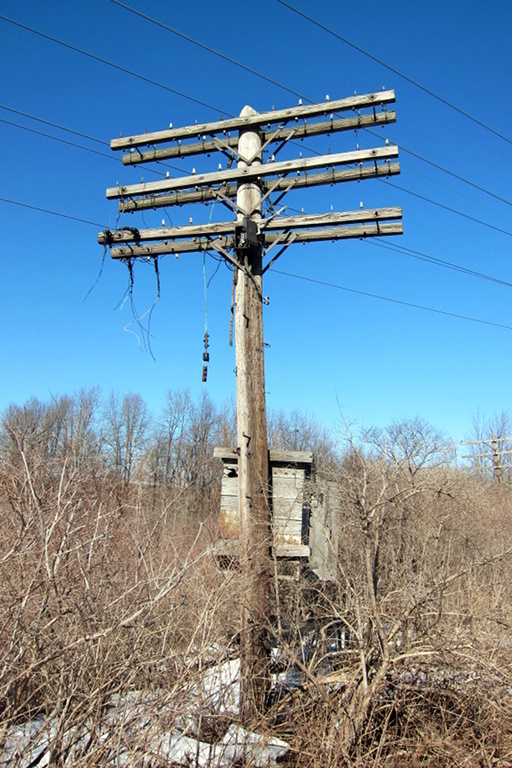 Given that it's located high above the ground, I'm guessing it housed electric relays or maybe a generator. Forth picture: WE MADE IT... and clearly, it was well worth the trek! 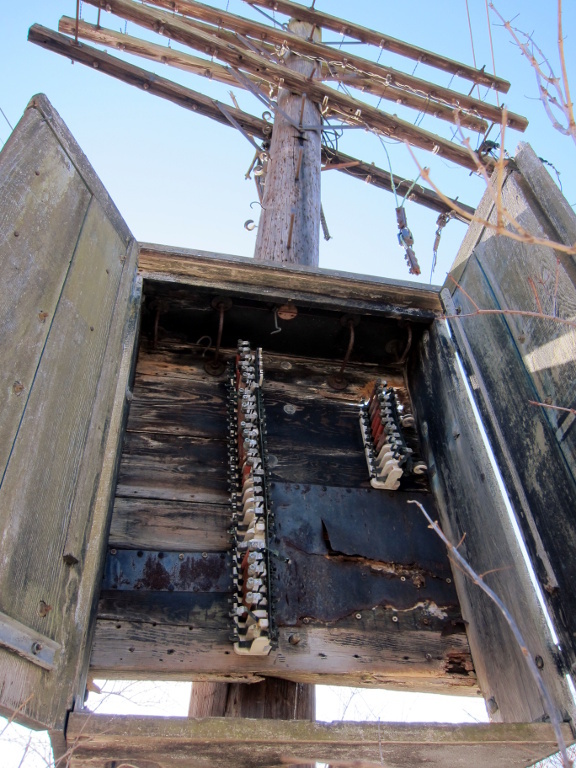 There are still a couple series fuses in place (the red tubes) that protected communications equipment from lightning. Across the tracks from the tower, up the embankment a few feet, were two steel bungalows, side-by-side. The west bungalow was the larger structure. I believe they contained circuitry for the Niagara Jct. interlocking plant. 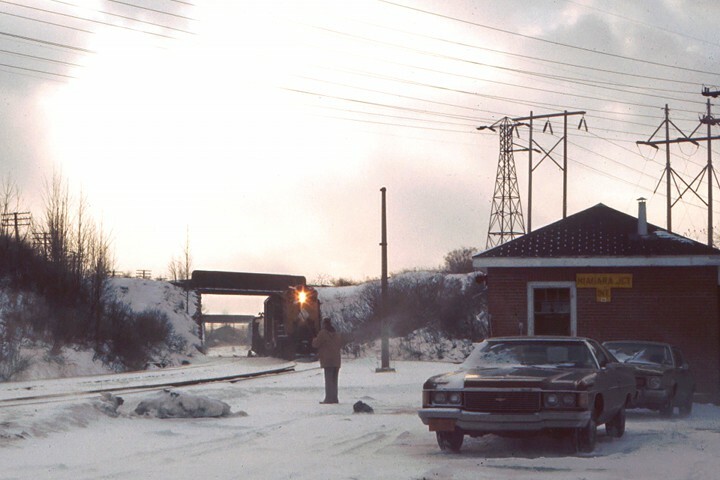 His perfectly framed 1973 photograph also shows the at-grade crossing and its safety light, located behind the blockhouse, where the main line branches North up the Niagara Falls branch. 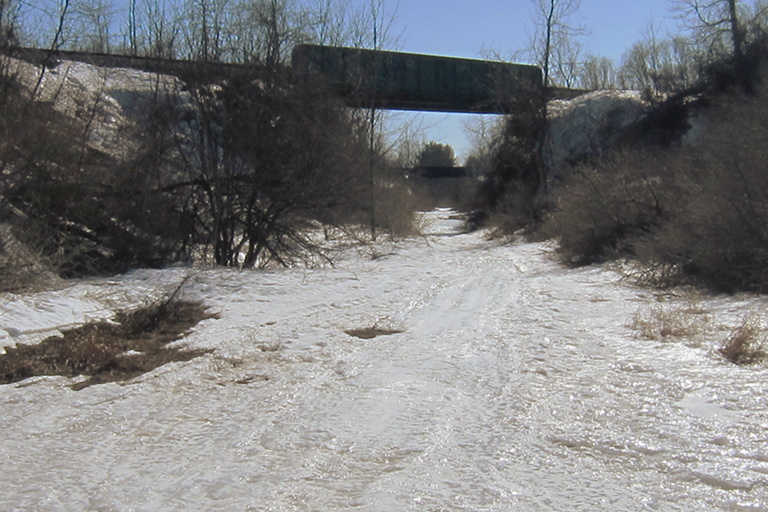 This road crossing alerted workers traveling to and from the blockhouse that a train was nearby. This picture was also published in Flags Diamonds and Statues, Vol 12, No.1 on page 30. By 2007, we're staring at a ghost junction; our steadfast tell-tale pole is now surrounded by only bits of rubble and foundation. Though, in looking at this Fall scene, it becomes apparent that Niagara Jct. is still a hauntingly beautiful place to visit, even in its abandonment. 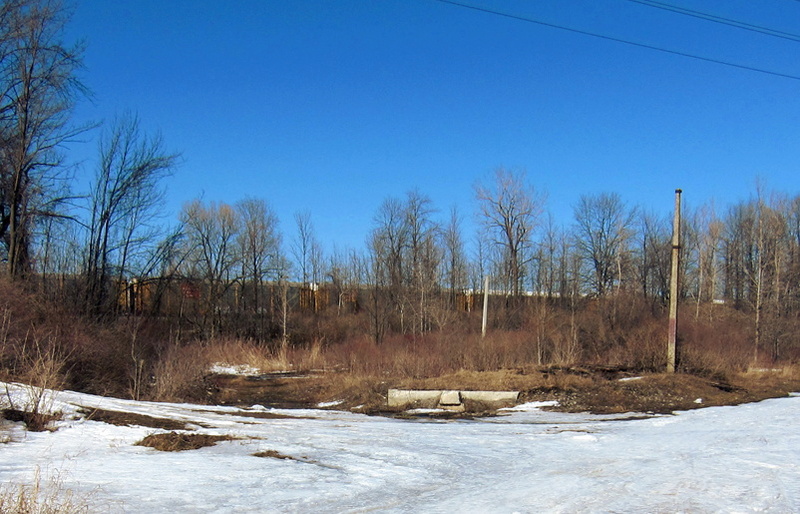 This small building is the remains of the Depew passenger station. 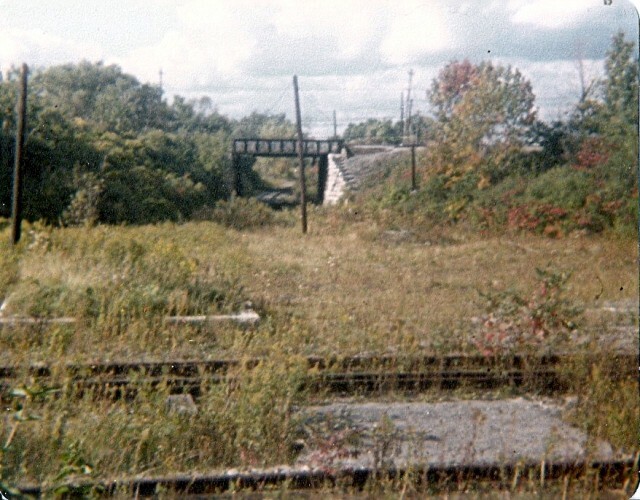 This was where the Toronto section of the Maple Leaf, trains 7 & 8, was taken off/added when passenger service was still offered. 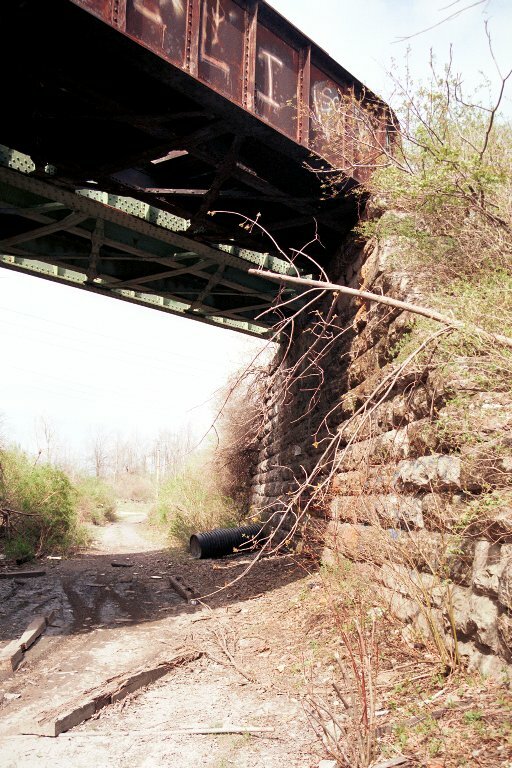 The structure was partially demolished after passenger service was dropped and the remainder of the building was used by the section gang/signal gang. This remnant was demolished at the same time as the tower. The yellow liquid propane tank in the background fueled the many switch heaters at the junction. It is also one of the few artifacts that still remain from the Lehigh Valley days. 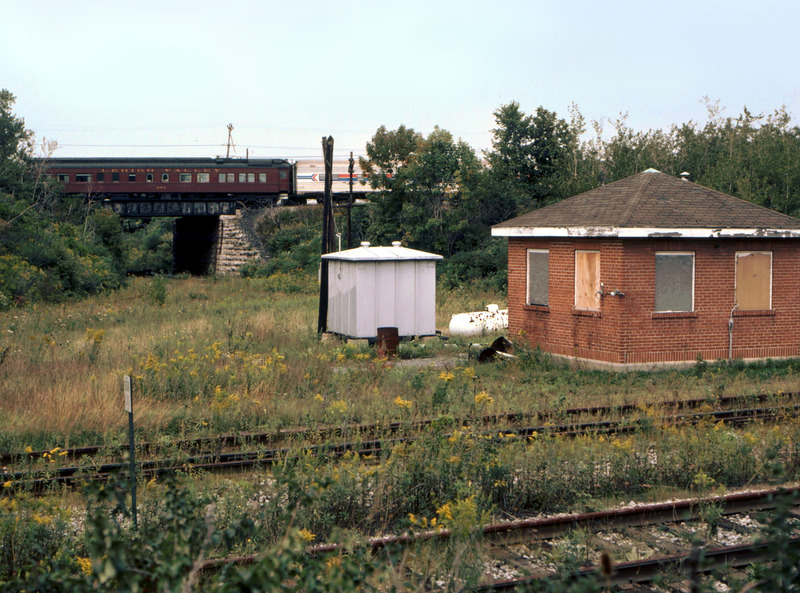 In 1981, the westbound home signal was still standing; It's also possible the signal was lit when this photo was taken. Even though the rusty rails beneath it hadn't seen a train for several years prior, for some reason, they left the signal powered on for the longest time. The semaphore was gone, so way down at Sheldon Avenue it always shone white... but it was lit! The top floor of this signal was also a great place to catch an evening sunset. I remember there was a bunch of equipment in that furthest control box, but later someone torched the whole thing. You cant see it, but there is actually a vast array of tracks and switches underneath all that horsetail and you had to balance-walk on the rails as there was usually standing water here. 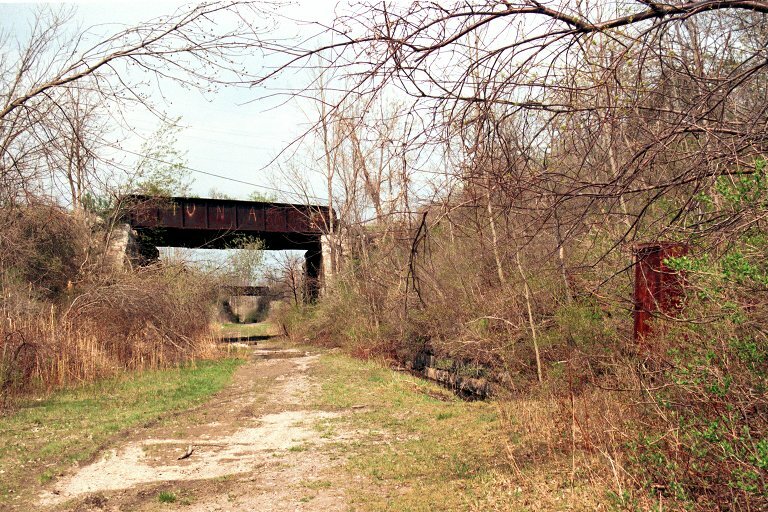 By April of 2008, the rails are long gone. 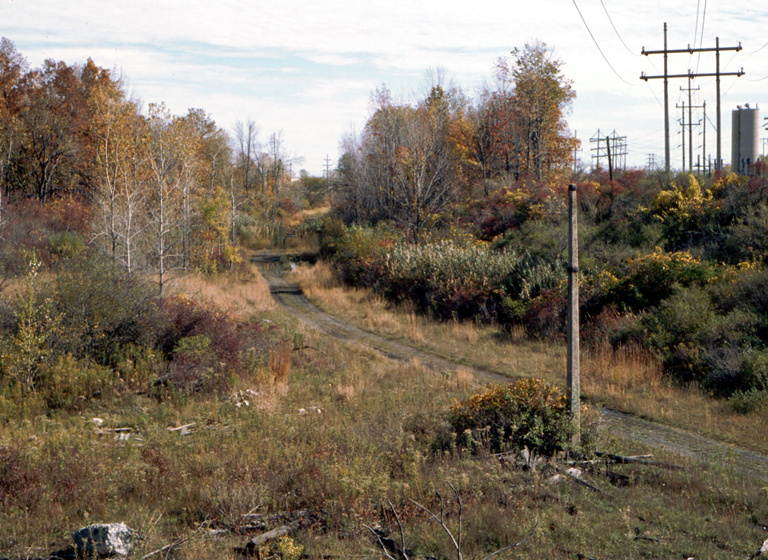 Paul Templeton reports that the rails remained intact up to at least June, 1983, but were gone by October, 1987. 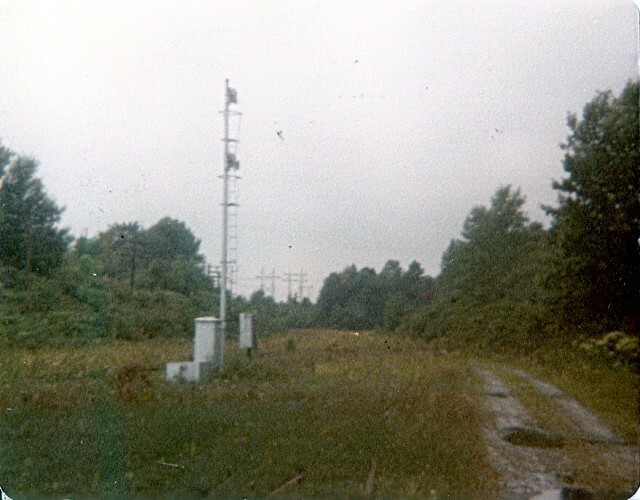 In this photo, the middle control box can still be seen between the weeds, however the westbound home signal was apparently replaced by a tree. Paul also notes that both this signal post and the one governing the western entrance remained standing as late as October, 1987. The next column of photos focuses on the signal/box where, if you look closely, you'll notice the whole place is covered in several inches of water. 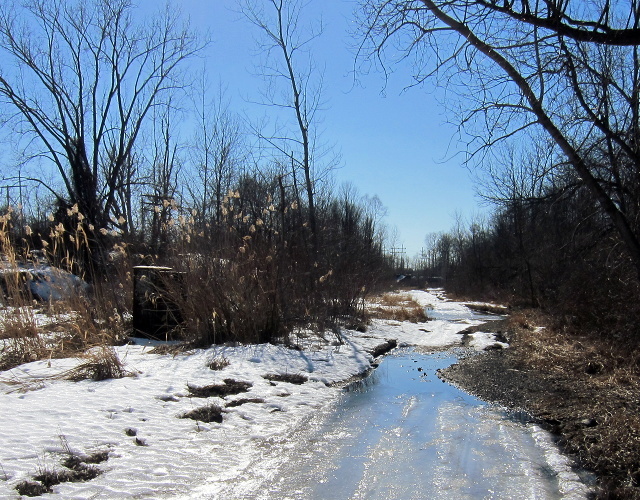 Yes, the drainage issue has gotten worse and the dirt road has turned into a running stream. It was at this point I realized I should have worn boots. 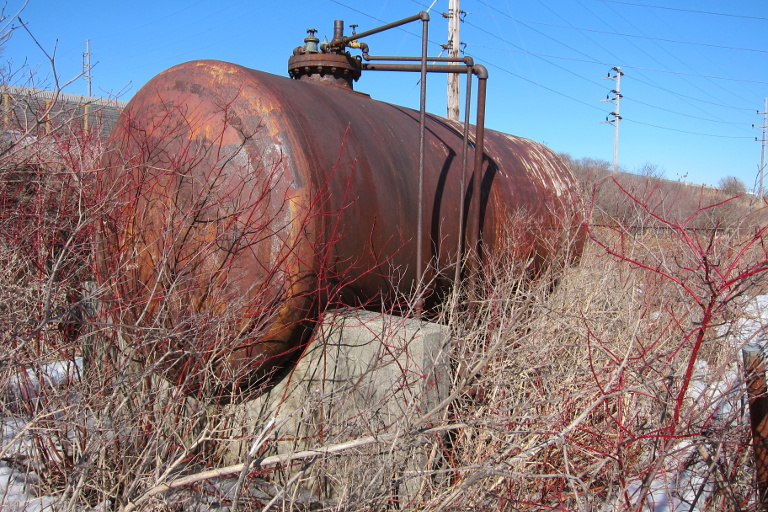 The pictures in the last two columns are taken a few steps East, where the liquid propane fuel tank quietly rusts away. In both of the fourth column shots, you will find CSX freight trains running over the old New York Central track. 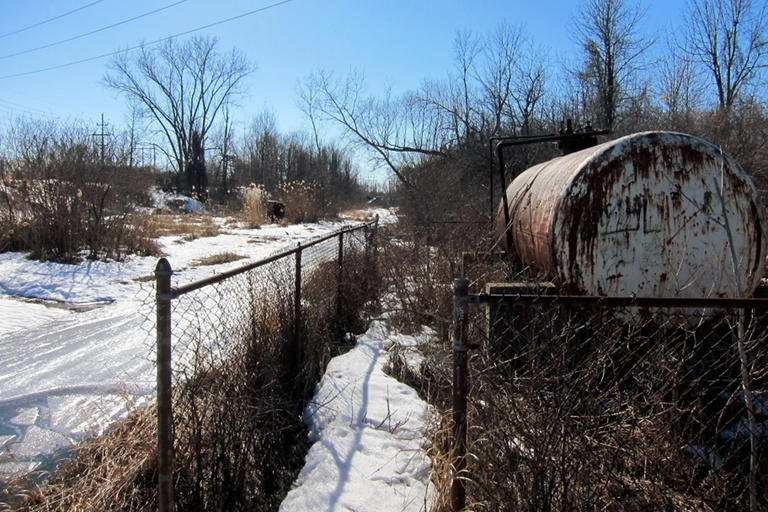 And the final column provides one last look back toward the Niagara Junction. > Your browser doesn't support HTML5 video in WebM with VP9 or MP4 with H.264. 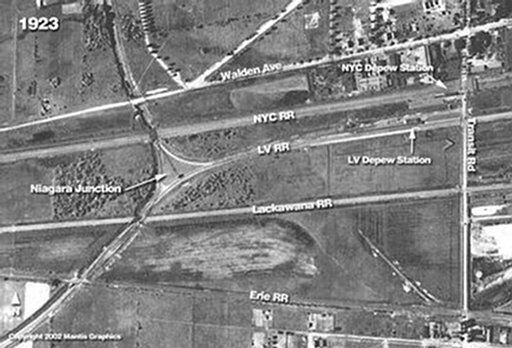 Starting from the (now-removed) Lehigh Valley bridge over Transit Road, we enter the junction from the East end. At about the 17-second mark is where the passenger station would have stood. At the 36-second mark, the astute observer will notice the rusting propane tank in the lower left-hand corner. And then at 1:15, Niagara Jct. itself finally slides into view. According to Paul Templeton who captured this scene, the track diagram in the red-bricked "Tower" was still lit up at this point in time. 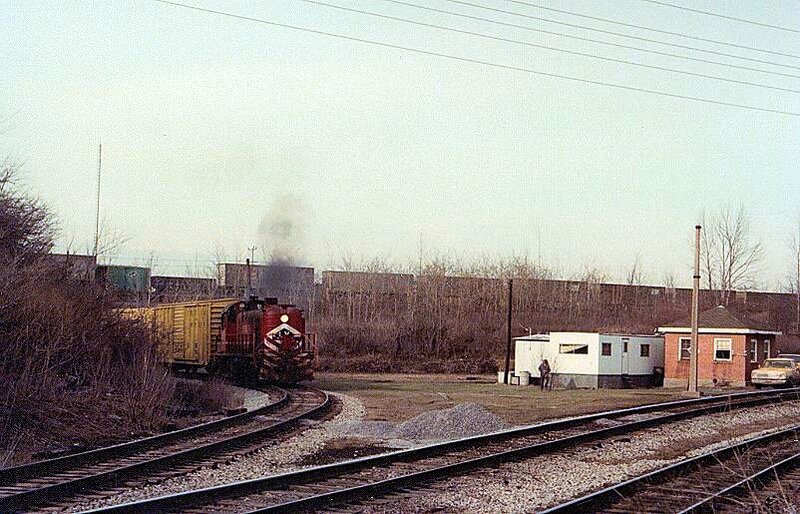 This photograph also brings back some memories for me, as this is what Niagara Jct. looked like the first time I stumbled upon it, during a Depew Hook and Ladder family picnic at Depew Fireman's Park. 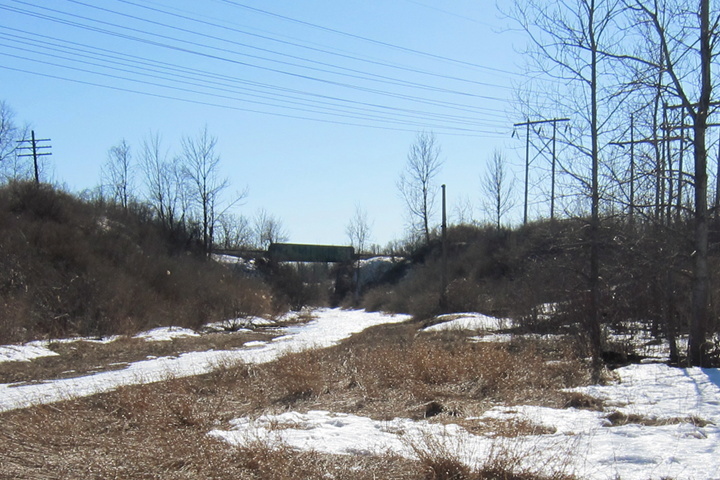 I heard a train but couldn't see it, so I followed the sound out behind the baseball diamond and down the embankment to catch a glimpse of the caboose as it headed into Niagara Jct. Naturally, I followed it, and the rest is history!